Seven years after the original version on TV's "Playhouse 90," writer Rod Serling's moving drama came to the big screen with all of its punch intact. 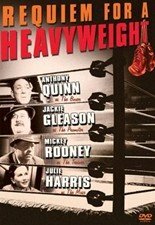 Anthony Quinn stars as faded boxer Mountain Rivera, faced with the end of his career in the ring and a trusted manager who bet against him and now needs his help. Jackie Gleason, Mickey Rooney, Julie Harris and Cassius Clay (Muhammad Ali), as Quinn's last ring opponent, also star. 86 min. Standard and Widescreen; Soundtrack: English Dolby mono; Subtitles: English, French, Portuguese, Spanish; theatrical trailers.